Well then. Fell off the blogging planet for a little while there, while simultaneously in the real world experiencing SO MUCH fibre and crafting-relating amazingness that now I’m in front of the computer I hardly know where to start. Hello though! How’re you? Good start to 2019 so far? Sooo – let’s kick off with a newly-minted pattern. 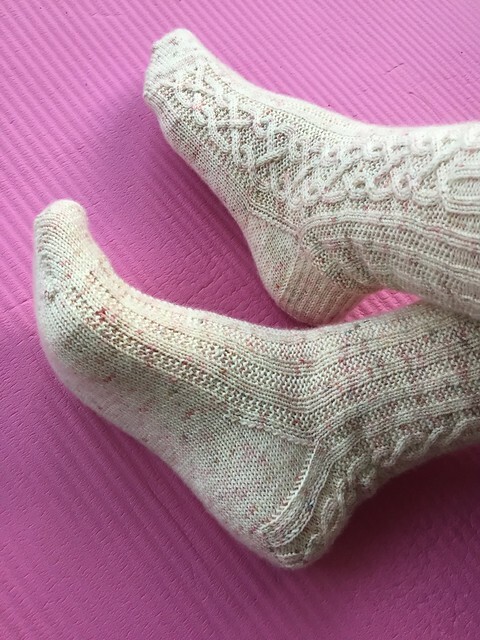 The Afternoon Tea socks pattern is freshly tested and edited, and available for you to buy now on Ravelry (WAIT A SECOND THOUGH, keep on reading for a special offer on this pattern exclusively for blog readers!). I’m super-happy about these socks. I had a small army of test-knitters checking them in every size for me (thanks, guys!) 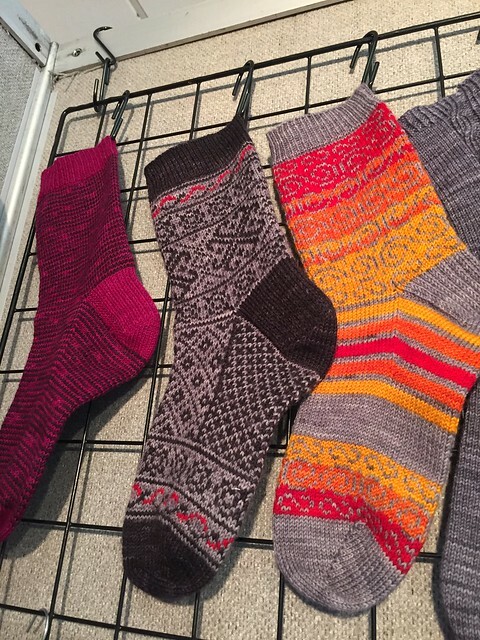 and all their hard work inspired me to knock out a quick pair of ankle-sock versions. LOOK AT THEM! I might love them even more than the full-length pair. The promotion will run until the end of Tuesday 1 April, 23:59 British Summer Time. I am so sorry I didn’t let you all know sooner, but please do go and get your money-off while you can (if you like the pattern!) – you guys are so supportive and deserve all the discounts in the world! IN OTHER NEWS, a little fibrey-get-together happened over the last week up in Edinburgh. 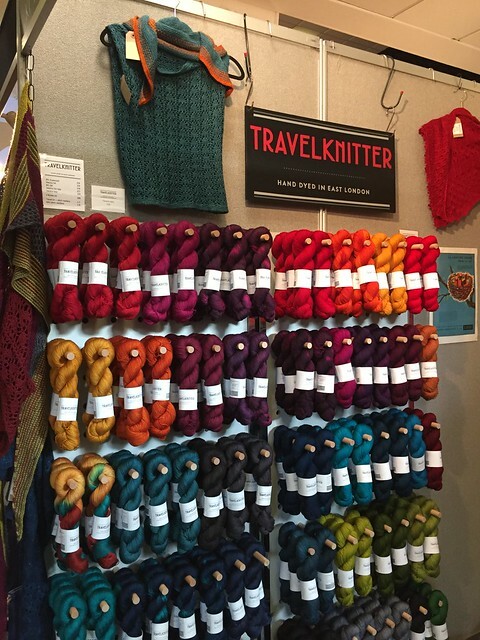 And THIS year I was there working on a stand – I helped out Travelknitter all weekend selling her utterly gorgeous yarn. We had a prime spot right by the entrance and OH MY we had an awful lot of customers! I really wish I had a whole pile of photos to show you, but the truth is we were so unbelievably busy that I hardly had a moment to take a breath, let alone take pictures. So you can have a few of our stand, which was basically the only thing I managed to photograph. This is how the yarn looked on day 1. It was substantially reduced by the end of day 3. The whole experience was absolutely amazing – despite the exhaustion I massively enjoyed meeting so many crafters and talking about their likes and dislikes and planned projects for Larissa’s yearn. It was also an utter delight meeting a handful of YOU guys – thank you so much to the people who came and sought me out! I also managed to squeeze in a quick half-hour coffee break with Katherine from Fiber and Sustenance which was far too short but a really lovely pause in a manic weekend. 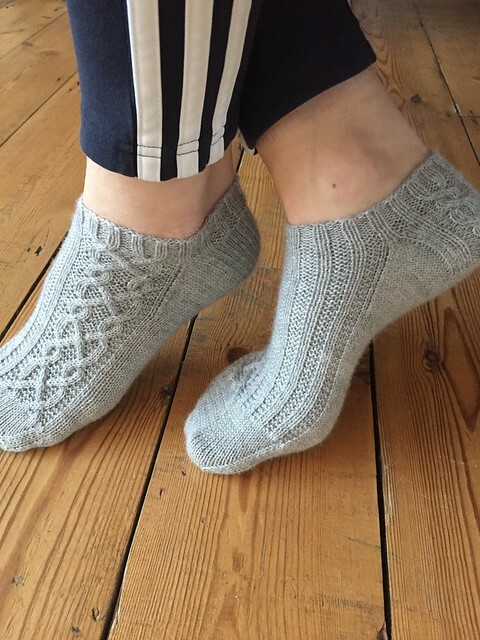 (She has a new sock pattern out too – take a look!) If you need proof that I was actually there, here’s me and a very tired Larissa from day 1 (migraines before a yarn festival are not a good thing! happily she perked up from meeting all the amazing customers). I can also show you the few things I managed to nab for myself (nearly all exclusively bought during the quiet period before the doors properly opened at 9am). I seem to be getting choosier and choosier when it comes to buying yarn (I went to Unravel in Feb and only bought one skein! ), but the few I have here make me really happy, and the accessories and notions are all amazing. Clockwise starting top-left: envelope project bag from Pink Hazel; two skeins of Enchant (alpaca/silk/cashmere) from Skein Queen (her last EYF! 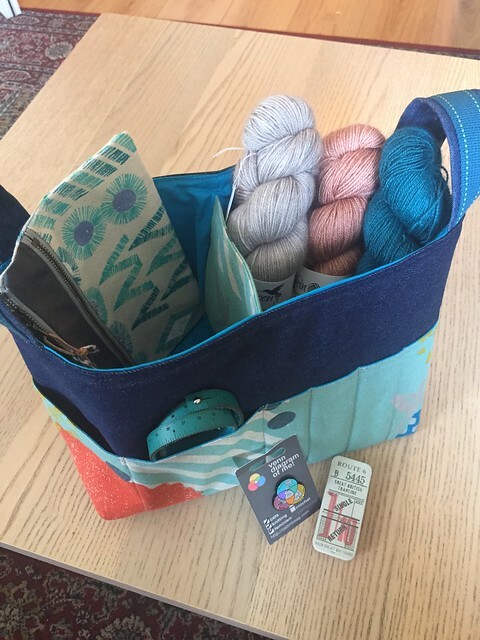 glad I snapped these up when I could); a skein of Scylfing Sock from Triskelion Yarn (my current WIP is in this no-nylon sock yarn and I am in love with it – hopefully more on that in a future post); one of the very last travel stitch marker tins from Travelknitter (sadly discontinued! luckily I had an ‘in’ with the vendor…); a ‘venn diagram of me’ pin badge from An Caitin Beag; my second leather wrist ruler from Beyond Measure (I could honestly have spent my entire budget at their stand); and the whole lot nestling in an awesome caddy bag also from Pink Hazel which was a present from Larissa. And now I am home again in London, and spring is here which is definitely helping beat the post-EYF blues (sunshine! blue sky!). Enough rambling from me now though – how’re you, friends? It was so lovely to see you and YAY FOR AFTERNOON TEA! I love love love the ankle sock version!! Ahh thank you! It was so so nice to take a moment to catch up with you – hopefully see you in a month or two where we can do it again without having to rush! Also I hope you are going to post about your amazing purchases – can’t wait to see them. I live in Glasgow and I’ve still never made it to EYF yet! It sounds amazing, I must sort myself out and get there next year. You definitely should! 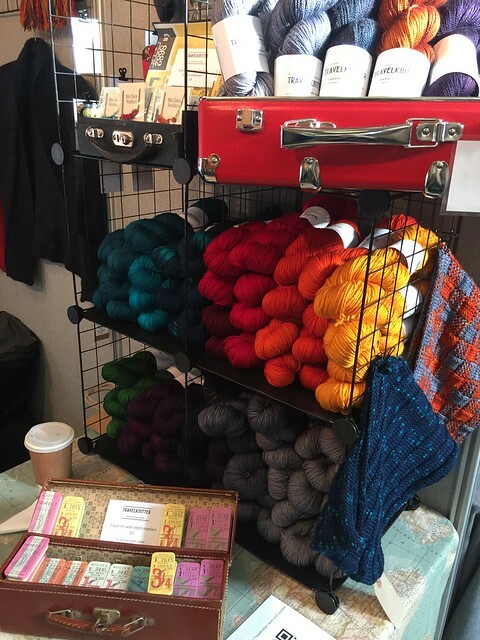 It’s an incredible yarn festival with so many lovely vendors and fantastic yarns and other crafty things to admire. It’s probably a good thing as then you know you have yarn that will go with other yarn, rather than having skeins that don’t quite have a use in the stash. Thank you so much Paula! 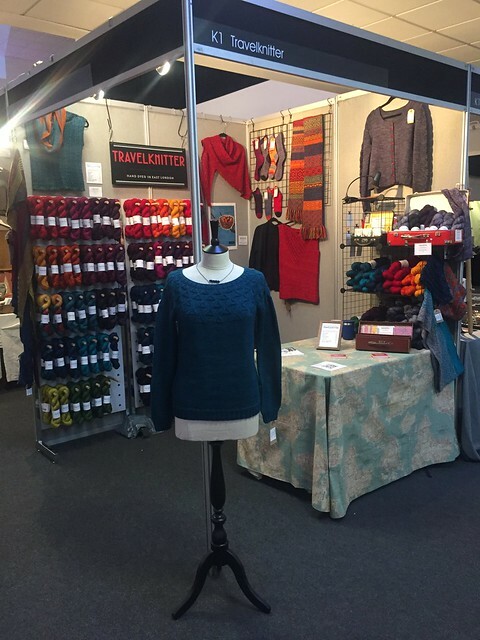 Yes EYF was amazing, though I am only now getting back to normal in terms of sleep (I don’t think I’d realised quite how tired I was! ).